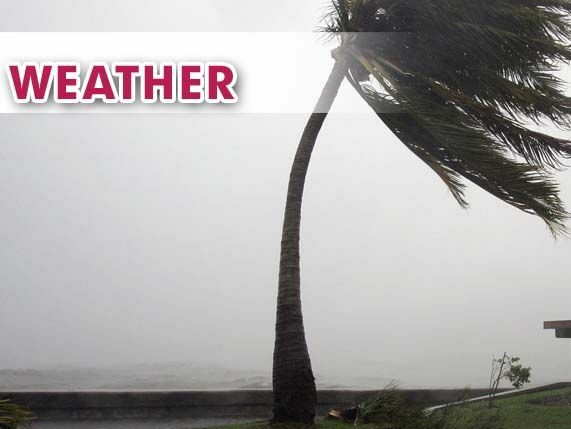 The National Weather Service in Brownsville is warning Rio Grande Valley residents of high winds as the year’s first cold front blows in unusually early. Meteorologist Robert Frye said the cold front would arrive Monday afternoon and evening. Frye said temperatures in Cameron and Hidalgo counties would be in the lower 40s by Tuesday morning with a forecasted high of 49 degrees. However, along with that cold, Frye said there will be strong winds. “The big story will not be the rain. It will probably be the wind,” Frye said, adding that there may be a scattered shower here and there, but nothing severe. Expect any remaining Halloween decorations or unsecured trash cans to blow around. High-profile vehicles should take caution on the roads, especially on Interstate 2 north, because of expected 30 to 35 mph winds. Anyone driving to South Padre Island should keep both hands on the wheel as wind gusts at the Queen Isabella Memorial Bridge could reach 50 mph, Frye said. “Since this is the first time we’re going to be dropping so low, we’re trying to get the message across the exposure is going to be a big thing,” Frye said, adding that in addition to the homeless community, pelicans that sometimes land on Highway 48 as they try to return to the Bahia Grande for the night are also in danger because of the wind and cold weather. The Texas Parks and Wildlife Department, the Texas Department of Public Safety and other local agencies are reminding motorists traveling between Brownsville and Port Isabel to slow down and watch out for pelicans landing on Highway 48. However, in the past, the hardest hit populations have been undocumented immigrants. Each winter, when temperatures reach freezing levels, Border Patrol has routinely reported discovering the bodies of undocumented immigrants who died from exposure in the ranch lands. While temperatures are expected to be in the 40s, those wind gusts could place wind chill temperatures as low as the 20s, Frye said. “I know the calendar says that in November typically we don’t get this cold, but it’s a perfect setup across deep South Texas for a pretty dramatic cool down,” Frye said. The Rio Grande Valley could even be setting some record lows this week, Frye said, adding that temperatures may hit the freezing mark on Wednesday and Thursday morning in Harlingen, San Benito and possibly even northern Brownsville. On Monday afternoon, the weather agency had already issued a freeze watch that is in effect for northern Hidalgo, Brooks, Jim Hogg and Zapata counties between midnight and 9 a.m. Wednesday because of a possibility that temperatures will range between 29 and 32 with even colder wind chills. However, the weekend could bring warm relief, with a possibility that temperatures will rise back into the 70s by Sunday. “There is a light at the end of the tunnel,” Frye said.